Thanks! I really appreciate that! Yeah I'm taking a mini break but once I feel a surge of motivation I'll try to start the area I mentioned for the demo, I usually get really motivated to work on my game when I sometimes pull back and play other games for a bit. I've got a few new enemies already planned for it. 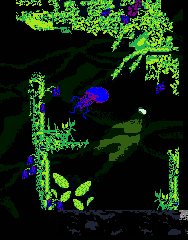 I should consider making more types of plant enemies too since there's tons of cool things I could do with them. Here's a quick gif showing how the explosive seeds/pollen can cause a chain reaction when shot that can take out a whole field of them. I don't expect people to try to dodge the projectiles when there's this many plants at once, A shield will most likely be required if you take on any fields of them. Hope you don't mind me suggesting, but if programming(GameMaker) and/or music end being too much of a hassle in the end, maybe I could help? I'd definitely welcome the help when the time comes thanks! 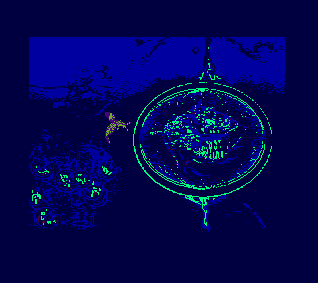 I'm a big fan of glitchy, 8-bit art, so this aesthetic is super cool to me. I really like the premise of making a game in the style of a forgotten prototype: there's a lot of cool space there for meta-narrative stuff if you're so inclined. Thanks rinski! 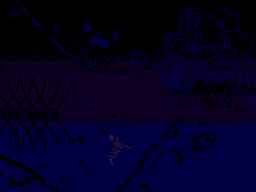 I really like what you posted in the pixel art thread by the way, the whole abstract form narrative stuff looks super interesting! I've been mostly focusing on visuals so far so I haven't put as much thought as I probably should into story beyond what I wrote in the original post but seeing your stuff reminds me how much I love those kinds of concepts so I'll keep that in mind. So I have been planning things for the game between being busy with other things but other than that I haven't made any real progress on the game itself. 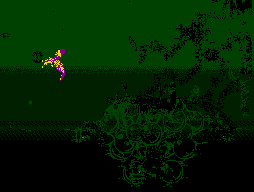 Mostly just figuring out what I want to do for the beginning of the game and the demo. 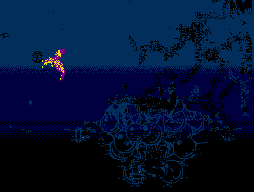 Here's a mockup showing the spectral nautilus that will phase onto the screen in an early cutscene like part. Also here's a gif I shared a while ago showing a near end game area, I reposted it here to compare with the next shot from deeper within the area. 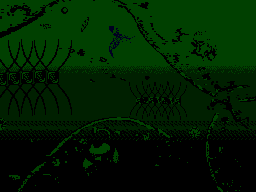 I finished Rogue Dawn the other day, a certain region from that game inspired me try to expand on my own cellular/plankton region. I was already considering making the interior area very colorful so seeing that motivated me to attempt a mockup myself. I like how it looks for now but If I find it to be too similar to Rogue Dawn I may tweak it a bit at some point or just come up with something different. I also don't want to stray too much from the plant themes and the more natural looking palettes so I'll probably find ways to make it fit a bit better later on. Edit: Here's a few variations of the mockup that might fit better. 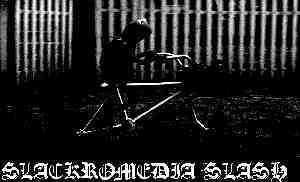 Also added a bunch of tracks to my soundcloud, it originally only had 3 tracks from the game but now there's 15! The other day I found another old sound test I recorded years ago I completely forgot about so I now have even more musical content for the game. Still unsure if I'll use all of those tracks since some might be a bit harsh/annoying or repetitive. If any musicians out there have anything in a similar style or something in the style of music from Ecco the Dolphin for the genesis I'd love to add some more memorable tracks to the game so let me know! The art does a really great job of capturing nature how it really is, rather than how you typically see it depicted. Would surely play this. 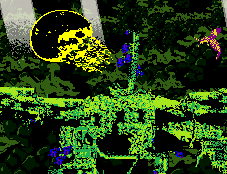 I just love how it looks... like an overdriven version of the early 80s games on C64! Reminds me of "The Human Race". Thanks! I can definitely see the similarities. 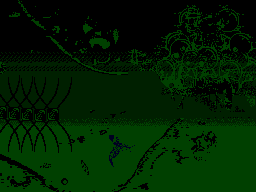 I'm actually kind of tempted to make a mock up at some point that looks closer to a c64 game. 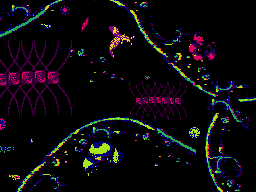 I've always wanted to make something with wide pixels like that. Really love how the game looks and how the color scheme changes between areas. I feel like some games really stick with a single color palette, and that can get boring quite quickly, so good thing you're switching it up . I feel like the player sprite could be a bit more animated though, the two frame animation can get quite annoying after a while. Brilliant aesthetic you have going. Those volcanoes are confusing me a bit though. I feel like you shouldn't be able to see the insides of the volcanoes unless the player can reach the interior part. Look really great, keep it up. @maji - Thanks! And good point about the animation, I've noticed that before but I guess I just got used to it. I'll definitely give it a try though and see if I can smooth it out a bit. @RofB - It does look a bit odd at first but you will be able to go down certain volcanoes that will lead to steamier regions. Also having that occasional inside view allows me to do other things like having plants where you can see the roots in the ground or even having worms tunneling around. But the main reason is I wanted them to look similar to the small volcanoes in Bonk's Adventure that have always stood out to me because of that. 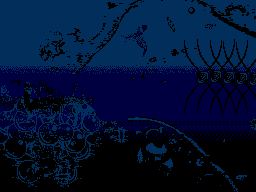 Bonk and Ecco the Dolphin have been the main inspirations for the aesthetics of the game. Anyways thanks, glad you like it! @joey4track and Bricabrac - Thank you!! There's a few visual mockups I've been wanting to test before working on anything else in the game so I'll try adjusting the bee's animation later, it should be a simple fix when I get to it. Today I tested this scene in motion, I previously showed this as a still mockup. Nothing too interesting but I thought it looked nice enough to share. This is just one basic variety but other worm creatures will have things like little pauses in their movements which look more like a natural caterpillar crawl. There will be giant millipedes too so those might look nice with the little pauses since that would cause that wave motion in their leg movement. 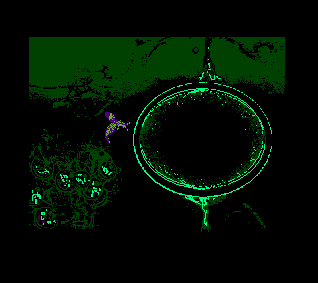 Another visual test. The spinning copter seeds will probably be used in a different area. They're mainly just decoration although I was thinking they could also be used to indicate wind in certain areas, along with falling leaves. This is within the same area as the mockup below that I previously posted.